Yes, it’s been an awful year. But the untold story is that grassroots activists have actually frequently prevailed. Yes, the election results were generally awful. But the untold story of 2016 is that grassroots activists, bold campaigners, and the movements they embraced frequently prevailed—and their successes showed progressives how to press forward even in the most frustrating and difficult of times. 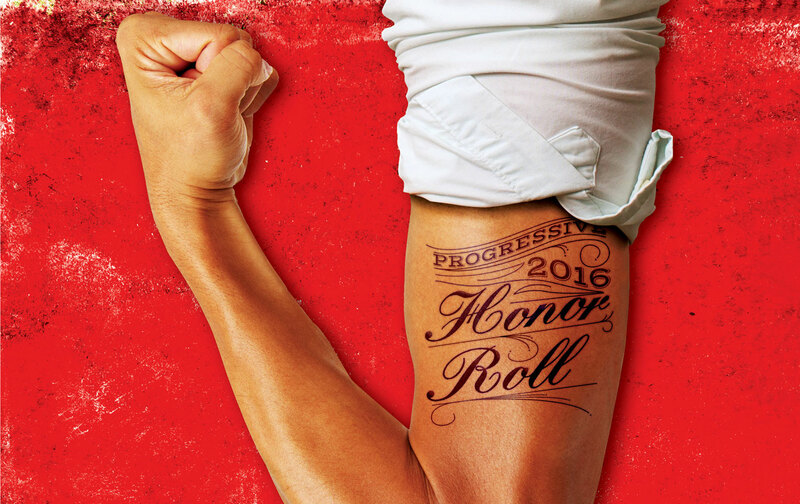 Our 2016 honor roll of the most valuable progressives is a chronicle of the fight that has already begun, and a road map for the resistance yet to come. “So, are you guys ready for a radical idea?” the Vermont senator asked as he kicked his 2016 presidential campaign into high gear. Sanders was speaking about creating “an economy that works for all of us, not just the 1 percent.” But he could have been referring to the idea of a presidential bid by a seventysomething democratic socialist from a small state that began, as Sanders likes to point out, at just 3 percent in the polls. “We had no campaign organization and we had no money. And we were taking on the most powerful political organization in the United States of America,” the senator recalled. Yet his rallies would soon fill the largest halls in the country, and he would go on to win more than 13 million votes, 23 primary and caucus contests, and more than 1,800 delegates. That wasn’t enough to clinch the nomination, and Sanders is the first to admit that his campaign made strategic mistakes in its initial outreach to key Democratic constituencies and superdelegates. Yet he won overwhelming support from young people; he forged a coalition that energized Native Americans, Arab Americans, rural voters, and displaced and disappointed workers across the country; he opened up transformational debates about the Trans-Pacific Partnership trade deal and about pipelines and climate change; and his supporters played a crucial role in writing the most progressive platform in the modern history of the Democratic Party. Most important: Sanders encouraged his backers to build an organization, Our Revolution, to extend the energy of his progressive populist campaign beyond 2016. As Republican presidential candidates were outdoing one another giving voice to anti-immigrant bigotry last February, Wisconsin Republican legislators suddenly backed off a plan to penalize municipalities that respected the rights of immigrants in their interactions with police. The announcement that the scheme was “not a high priority for any of [the GOP] members” came just hours after the “Day Without Latinos and Immigrants” protest, which saw 20,000 restaurant, grocery-store, warehouse, and dairy-farm workers leave their jobs to surround the Capitol. “The mass general strike was an undeniable statement of the essential and positive contributions that immigrants make to our economy and our society,” said Christine Neumann-Ortiz, executive director of the activist group Voces de la Frontera. That statement was heard, loud and clear, by the state’s Republican legislators, who finished the session without taking up the bill. Within hours of Donald Trump’s announcement that he would appoint Steve Bannon as his White House chief strategist, Merkley declared: “There should be no sugarcoating the truth here: Donald Trump just invited a white nationalist into the highest reaches of the government.” Others may have reacted with shock at Trump’s election, but the Democratic senator from Oregon was ready to fight. He ripped the Republican’s cabinet picks and promised scrutiny and opposition. Along with close allies Elizabeth Warren and Bernie Sanders (whose presidential candidacy the Oregonian had backed), Merkley was in the forefront of successful efforts to block the Trans-Pacific Partnership in 2016. Now he’s objecting to Trump’s empty sloganeering and cheap gimmickry when it comes to the serious work of renewing American manufacturing and investing in infrastructure. As a veteran legislator who served as speaker of the Oregon House of Representatives before defeating a Republican senator in 2008, Merkley has emerged as an essential opposition leader—someone who knows how the Senate works and pulls no punches when it comes to taking on racism, sexism, economic inequality, climate change, and Trumpism. California’s attorney general celebrated her landslide election as the state’s new US senator by visiting the Coalition for Humane Immigrant Rights of Los Angeles. Choking back tears as she recounted stories of children who asked after Trump’s election whether they would be deported, the daughter of immigrants from India and Jamaica declared, “You’re not alone. We’ve got your back.” That’s not just rhetoric; it’s who Harris is. “I grew up with a stroller’s-eye view of the civil-rights movement,” says the next senator from America’s most populous state. “Often I joke that as a child, I was surrounded by adults marching and shouting for this thing called justice.” In the Senate, she’ll be the one raising her voice for social and economic justice, and she will be heard. When permits for the Dakota Access Pipeline were denied, Washington State Senator Pramila Jayapal tweeted: “YES! The people’s victory! Moral Resistance works!” Though her title as of January will be “US representative,” the Seattle Democrat is a heart-and-soul advocate who knows how to link struggles in the streets to struggles inside the corridors of power. And she’s good at it: As a veteran immigrant-rights and civil-liberties campaigner, Jayapal brings a wealth of grassroots experience to the House. Savvy Democrats will take her counsel as they seek to build a moral resistance to Trumpism. While Democrats were struggling to figure out how to reconnect with rural Americans following 2016 election setbacks in most of the country, family farmer David Zuckerman was preparing to take office as Vermont’s second-highest-ranking state official. Elected as lieutenant governor with the support of Democrats and the state’s independent Progressive Party, Zuckerman campaigned on his record as a state legislator who led fights for sustainable development, GMO labeling, cannabis-law reform, and progressive tax policies that benefit working families in rural and urban areas. Elected on the same day that a Republican won Vermont’s governorship, Zuckerman ran 20,000 votes ahead of the top of the Democratic ticket—piling up votes in rural regions that don’t always back the party. Donald Trump made one of his last campaign stops in Minnesota, where he tried to win the state by stirring up fears of the large Somali-American community in the Twin Cities. Trump lost—and on the same day, Minneapolis voters elected Ilhan Omar to the state’s House of Representatives. Raising a clenched fist and pledging to struggle for unity and justice, the first Somali-American Muslim woman elected to public office in the United States declared: “It matters that I am a woman. It matters that I am a Somali-American woman. It matters that I am a Muslim and immigrant woman. It matters that our campaign won…by creating a multicultural coalition.” She is so very right. The media outlets that so badly bungled coverage of the 2016 campaign imagined that Donald Trump made the Trans-Pacific Partnership an issue. Wrong. Lori Wallach and the mass movements with which she has long been aligned made the TPP an issue well before Trump began to consider a presidential run. As the director of Public Citizen’s Global Trade Watch, Wallach has for decades exposed and challenged race-to-the-bottom trade policies, and she has worked with labor, farm, environmental, and human-rights groups—as well as congressional allies like Bernie Sanders—to establish a fair-trade ethic that respects workers and the planet. “Americans have become aware that our trade agreements have been hijacked by corporate interests that use the free-trade brand to Trojan-horse into place special protections,” the veteran of the 1999 “Battle in Seattle” against the World Trade Organization said during the 2016 campaign. That awareness wasn’t forged by a “billionaire populist”; it was forged by movement builders like Wallach. Bold, loud, and fiercely committed to transformational change, National Nurses United has always campaigned for single-payer health care, adequate hospital staffing, and labor rights. But the union extended its reach in 2016, emerging as a key backer of the Sanders campaign and the People’s Summit that sought to build on its momentum, as well as a California initiative to control prescription-drug prices; the national “Robin Hood Tax” campaign to fund social needs; efforts to combat climate change in communities across the United States; and the movement to block the Dakota Access Pipeline. NNU actually seeks out causes to join, urging Americans to “Tell Us Where It Hurts” as part of its Nurses’ Campaign to Heal America. CNN commentator Van Jones came into his own during the 2016 campaign. Unlike the pundits who responded to every unsettling development by resorting to shallow talking points, Jones was informed and insightful in his approach. The veteran environmental and human-rights campaigner, who once served as President Obama’s green-jobs adviser, argued that “a bipartisan political consensus” forged by elites in both parties had sold out working Americans. Yet Jones was never willing to settle for simplistic explanations regarding the response to that sellout. Jones recognized the “rebellion against the elites” that defined much of the 2016 campaign, but he demanded that others recognize the racial component in what he described as the “whitelash against a changing country.” With equal measures of intellect and humanity, Jones wrestled ably and honestly with what he referred to as “the messy truth” of American politics in the 2016 election. Veteran broadcaster Mitch Jeserich started a radio program called Letters From Washington to chronicle the first 100 days of the Obama administration. That program evolved into Letters & Politics, which airs daily on Berkeley’s pioneering Pacifica station KPFA. Erudite and adventurous, Jeserich can jump from a discussion about how civilization has changed over a thousand years with historian Ian Mortimer, to an examination of Islamophobia with international human-rights campaigner Arsalan Iftikhar, to a review of Trump’s conflicted cabinet picks with Pratap Chatterjee, the executive director of CorpWatch. This is talk radio that makes you smarter. Despite assaults on voting rights and the very infrastructure of democracy, Hillary Clinton beat Trump by roughly 3 million votes. But Trump narrowly prevailed in enough swing states to claim an Electoral College win—the second time in less than 20 years that a Democrat has lost to a Republican with fewer votes. California Senator Barbara Boxer is right: The Electoral College should be abolished. But the constitutional amendment Boxer proposes will be a hard sell in a GOP-controlled Congress. Luckily, there’s another way to let the people choose their president: The bipartisan National Popular Vote Interstate Compact, proposed by the National Popular Vote campaign, would require states to “allocate their electoral votes to the candidate who wins the most popular votes in all fifty states and DC.” The compact goes into effect after states with 270 electoral votes have signed on. So far, 10 states (and the District of Columbia) are in, and the movement is growing. The magazine that dubs itself “the solution to music pollution” has in recent election years also been the solution to political pollution. Instead of interviewing politicians, Under the Radar publishes a fall “Protest Issue” in which prominent musicians are photographed “holding protest signs of their own making.” The point is to highlight issues and ideas that might be neglected during the quadrennial cacophony of presidential politicking. The fall 2016 issue rocked, with Amanda Palmer’s cover-shot poster explaining that “Radical Empathy Is the Only Way to Gender Equality.” Inside, Thurston Moore’s sign demanded “Free Chelsea Manning,” while Kristin Kontrol’s declared “Black Lives Matter” and Billy Bragg’s proclaimed “Death to Cynicism.” “My job is to take people who want to change the world and punch through their cynicism,” Bragg told the magazine. That’s precisely what Under the Radar’s protest issue did. Listen to John Nichols discuss the year’s highlights on the Start Making Sense podcast.